Compliment your 08-10 Ford F-250/350's aggressive, good looks with Rough Country's 6-inch Radius Arm Lift Kit. Rough Country's 6-inch Lift Kit was engineered to retain the F-250/350's impressive factory specs while bumping up performance and durability where it's needed most. The result is an aggressive, lifted beast with a mean profile and balanced on and off-road ride quality. When changing a vehicle's suspension, the key to preserving ride quality is in keeping the geometry of all suspension components as close to their factory angles as possible. Rough Country's new 6-inch Radius Arm Suspension Lift features a set of ultra-durable Radius Arms, precision fit to bolt right into the factory mounts for an easier install and a more factory-like angle. At 27lbs each, these beefy, upgraded Radius Arms dwarf stock equipment while and feature durable Clevite Rubber Bushings for maximum vibration absorption. 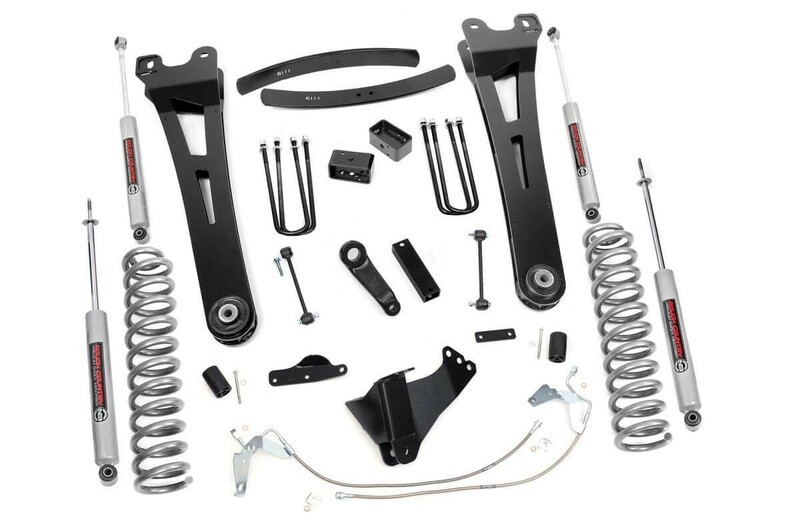 This all-inclusive kit also features an adjustable alignment cam at the axle to allow caster adjustment as well as a track bar relocation bracket and a drop pitman arm. A full set of N3 Shocks provide a truly balanced ride quality for on and off-road use - prefect for daily drivers. This kit also ships with a set of durable, lifted coil springs and brake line relocation brackets. Includes heavy-duty radius arms equipped with durable Clevite Rubber Bushings for maximum vibration absorption. New radius arms help maintain factory angles.